You can download and print this sketch over at the Sketch Support blog. If you use this sketch to create a layout, please consider adding it to the Sketch Support Flickr Gallery! you are on a roll here! very cute! What could be better than combining two hobbies in one?! 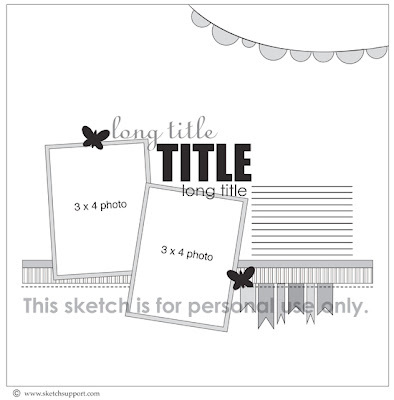 That looks like a really useful sketch, with space for plenty of journaling and two pictures. I like that. Great take on the sketch...another one to Pin! Great layout & what fun knitted items! I especially like the banner on this layout. Love the way the angle of your title supports the theme. YOur knitting projects look great! Wonderful job. Fabulous sketch and fabulous Lo!! I too love the long titles and this is no exception to my love! Excellent job on the sketch and the layout! Beautiful knitting projects. Love how you created the title. Finally catching up with blogs and been missing your fabulous pages! I always love how you mix up all those letters in your titles. Great job on this one!